MADRIX natively supports Philips Color Kinetics [KiNET]. The protocol is implemented in the software, which makes it easy to use Color Kinetics fixtures and Color Kinetics power supplies with MADRIX. There are several steps required to set up KiNET products in MADRIX. This chapter is only part of the process. 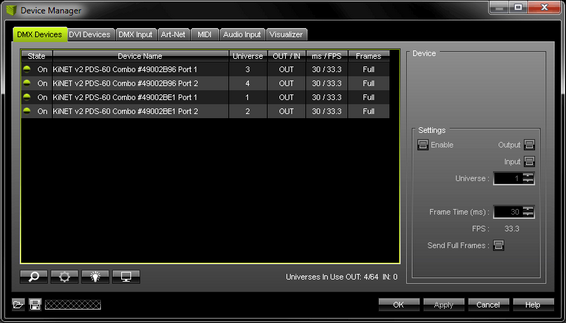 You need to set up other configurations as well [such as virtual LED matrix, DMX Devices, MADRIX Effects, Audio, etc.]. 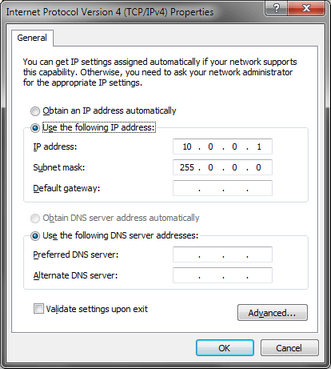 1] Set up the correct network settings in Windows. 2] Enable drivers in MADRIX. 4] Set up the DMX universe. 5] Set up the Frame Time. KiNET is a network-based protocol. MADRIX will use the network card of your computer to send data. ▪ You must use these IP address and Subnet mask settings. Otherwise, KiNET might not work! ▪ The IP addresses of your computer and your KiNET devices need to be different. - Always make sure that you have selected the correct network. Otherwise, the network device might still be found. But no data can be sent. ▪ Time To Detect Devices (s) - Defines how long MADRIX searches the network for devices during startup. Type in a value in seconds. - The default value is 15. - We recommend to utilize at least a value of 15 to allow for a sufficient search. Higher values are recommended for larger installations. ▪ Discovery Repetition To Detect Devices - Defines how often MADRIX repeats to search for and discover devices in the network within the Time To Detect Devices (s). - The default value is 3. ▪ Acquire Universe Assignment From Devices - If activated and if KiNET devices have been fully configured, MADRIX reads the assigned DMX universe from newly found devices and automatically sets it in the Device Manager for these devices. ▪ MADRIX automatically adds network devices it has found during startup to the list. ▪ Click if the devices have not been found. - MADRIX disconnects all DMX512, Art-Net, and other devices and starts to search for new or newly connected devices. - Do not rescan for devices if all of your interfaces have been found correctly. ▪ Select your devices in the list. ▪ There is a difference between KiNET V1 and V2. KiNET V2 makes sure that the panels will receive the data at the same time. This is particularly useful for large installations. Please see the Color Kinetics documentation to see which protocol is supported by your power supply. ▪ Make sure that your device is still selected. Rescan For Devices - MADRIX disconnects all DMX512, Art-Net, and other network devices and starts a new search for devices. 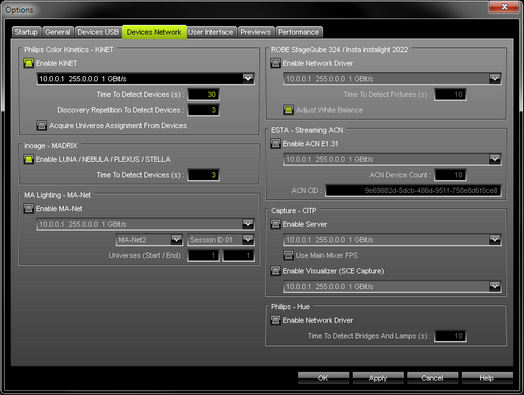 Highlight - Activates the highlight mode for the selected interface and universe under Preferences > Device Manager... > DMX Devices. Select one or more interfaces and click the button. The corresponding fixtures at the selected interfaces will flash for a better identification or tests. This makes it easier to see them on stage. It considerably speeds up the procedure of programming or testing the selected interfaces. If wish to resize the window of the Device Manager to see more devices in the list, simply move your mouse pointer to the bottom of this window. Then, select the border and hold the left mouse button, while moving your mouse downwards. Make sure to save your MADRIX Setup after the configuration process. ▪ Keep in mind that network devices, if activated, cause network traffic! ▪ When using a network-based output protocol and when the Startup option Start MADRIX After Booting Windows is used, it is highly recommended to also activate the Startup option Start With Timeout(s) with a value of 30 or higher. ▪ It is not recommended to use KiNET and communication over the Insta/ROBE protocols in the same network! ▪ It is not recommended to operate KiNET and access to the World Wide Web/Internet in the same network! It is recommended to run it in a separate network without internet access. ▪ Check if all network cables are connected and if Gigabit network components are used. ▪ Have all devices been found under Preferences > Device Manager... > DMX Devices? 1] Check if the IP address and Subnet mask are configured correctly in Windows and your devices. 5] Click Rescan For Devices under Preferences > Device Manager... > DMX Devices. 6] Try and deactivate your Firewall in Windows. 7] Make sure that the network is not forming a ring, were the start point is also the end point, and that data is not sent back to the source [the computer]. ▪ Are all devices activated under Preferences > Device Manager... > DMX Devices? Check if Enable and Output are activated. ▪ Check if all ports you are using on your device are configured correctly. Please check if ports, that are not used, are deactivated in MADRIX. ▪ Check if the DMX addressing and DMX universes are assigned correctly. Also check the Patch. ▪ Test if MADRIX is connected to the devices. Use Highlight Device for each of your devices. ▪ Go to Tools > Task Watcher. Check if the devices are sending data. ▪ Go to Tools > Logfile. Check if any error or warnings occur regarding the network or KiNET. ▪ Make sure all power supplies and controllers are working correctly. ▪ Remove any routers from the network. ▪ Demonstrate a lighting system using four built-in light shows: fixed color, color wash, rainbow, and streak"
▪ For example, the tool can be used to change the IP addresses of Color Kinetics lighting fixtures. ▪ Please note: Working with such a tool is only recommended for advanced users because settings can easily be adjusted wrong! ▪ The PDS-60ca DMX supports DMX512 via an extra interface [controlled by MADRIX] or Color Kinetics DMX controllers. The PDS-60ca ETHERNET uses KiNET and can be controlled via MADRIX without an extra interface. And the PDS-60ca PREPROGRAMMED does not support external data input. The official website now only lists two PDS-60ca. The second power supply now automatically switches between DMX and Ethernet mode.